We are way past my birthday now, but I am still getting reminders of my personal aging process. It has come to my attention that I am the father of a senior in high school. You know him as Son. All last year we knew he was a junior, and all summer long we knew he was about to be a senior, yet somehow it still feels like it snuck up on us. There are a lot of things that have to be done now, not the least of which is to find the right college. There are applications to fill out, scholarships to search for, and visits to make. And what kind of father would I be if I didn’t take Son to the Ole Alma Mater? More importantly, what kind of father would I be if I didn’t show him where to eat along the way? There are several ways to get to Oxford from Starkville – for those maroon and white locals that fear to tread there, you’ll just have to take my word for it. As a student myself, I took the back roads to Houston, on to Pontotoc, and beyond. That’s how you go if you want to stop at Seafood Junction in Algoma. These days I usually take the wider road to Eupora and up through Bruce, and that’s the way we went on this trip. Because of previous jobs that took me the same direction, I made friends along the way, so our breakfast stop at the service station in Bruce was intended to be a visit as well. Unfortunately, my buddy was not there; but that didn’t stop us from getting a biscuit. Son went safe and got the sausage egg and cheese – mine was thick-sliced bologna. The biscuit itself was great – nice and buttery without being too crumbly. And I enjoyed the bologna, but I would add this caveat: you really need to love bologna to love a bologna biscuit. The biscuit led to a question from Son: What is bologna, anyway? I confess I could not give him an accurate answer. Maybe some things are better left unknown. Days before we made the trip, I knew where we would be eating lunch. That’s how I roll. I had recently been in touch with another Starkvillian who not only graduated from Hotty Toddy U., he landed there after grad school and made it home. Through our social media connections, I noted that he was raving about Gus’s World Famous Fried Chicken, which had opened in Oxford not long ago. When I asked for more details, he described it as basically one thing: fried chicken. Either parts or tenders, with basic sides and great desserts. And he used the word “spicy”. I got a little nervous here, because I’ve had some ruthlessly hot fried chicken before and I wanted to know what I was getting into. I delved further, and he said it was “politely spicy.” I can adapt to politely spicy. 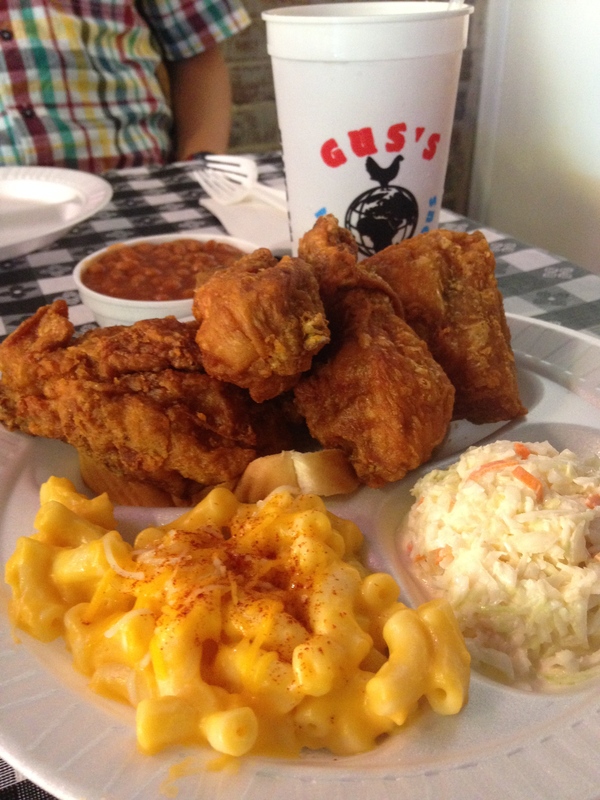 So off we went to Gus’s. The Oxford location is just off the Square, which usually means it’s close to everything but an open parking space. Such is life on the Oxford Square. You learn to deal with that because so many great Oxford eateries are on or around it. And a little walk when all you’re going to do is eat is not such a bad thing. 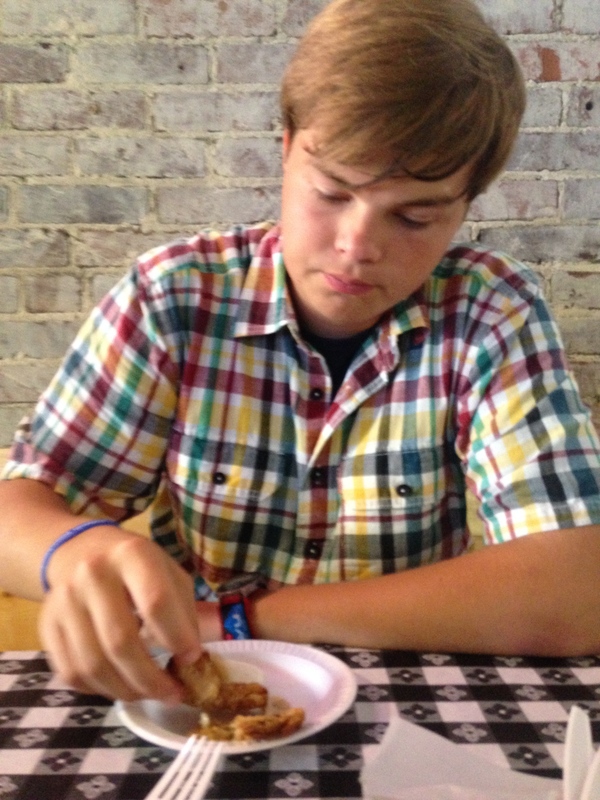 We started off with a plate of fried green tomatoes – I was proud of Son for branching out a bit, as he is admittedly wary of tomatoes in their natural state. Then we waited for a good long while, which according to the Gus’s website, is just part of the experience. We were in no hurry, and after a campus tour in the blazing heat, we were just happy to be in the air conditioning with an endless supply of sweet tea. Another unique feature mentioned on the website is the variation of spiciness. To put it as they do, it might bring tears one day or it might be “like the touch of an old friend.” I have no idea what that means. The day we went it was as my friend said: politely spicy – enough pepper to make a statement, but not enough to make your nose run. The crust was a little bit crunchy, but not crumbly-all-over-my-lap crunchy. The meat was tender and juicy. It was worth the wait. Dark Meat Special of the Day. We shared it. Really. When it came time for dessert, we were slightly hesitant simply because I already had some dessert plans for the trip home. Then again, multiple meals have never stopped me before, and we did have a recommendation already. So what do you do in that kind of situation? Well, you get something and share it, of course. They offered several good Southern pie options, but the one that caught my ear was chess. You just don’t see chess pie offered that often, so one must take those kinds of opportunities when they knock. The same goes for egg custard. I’d be willing to bet that many of you have never had an egg custard pie, and if you have, I’d bet you haven’t had one in a long time. Am I right? And I could probably say the same for chess. I asked Son if he’d ever had chess pie, and he could only come up with a memory of a chess square. Close, but not quite, so we ordered a piece, and it was just as good chess pie should be: insanely rich and buttery. A nice palate pleaser after politely spicy chicken. They say that sometimes the journey is just as important as the destination. The destinations were successes, both the campus visit and the chicken. Now it was time for the journey home. Stay tuned and buckle up (but not too tightly): it’s gonna’ be a tasty ride.